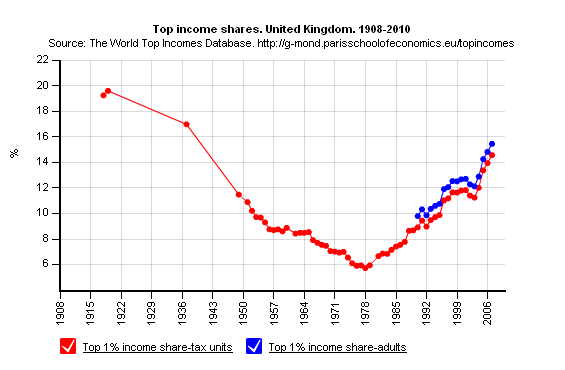 Down more or less consistently for the next seventy years to 1978, when it was just 6%. 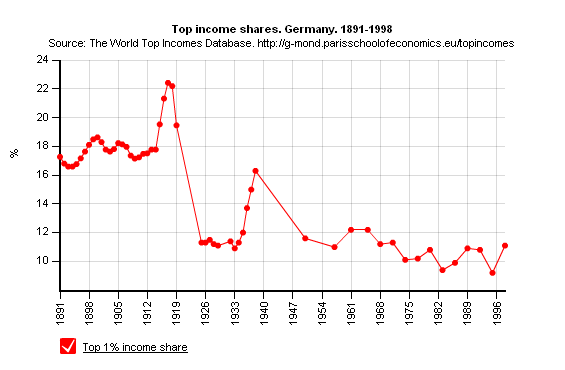 And just in case you thought there was some iron law that economic success requires ever greater levels of inequality, here is the German 1% for comparison… Admittedly the figures only go to 1998, but there is no evidence that the success of Europe’s powerhouse economy over the past two decades has been based on an ever increasing share of income being scooped up by the top 1%. No, indeed… so who do you think you are kidding Mr Osborne? If you want to see more, including international comparisions – and to generate your own fancy graphs for different time periods and income ranges visit the World Top Incomes database, courtesy of the Paris School of Economics.